Chocolate Chip Cookie Cake Pop – The classic flavors of a chocolate chip cookies smashed into a mini cake pop. Made with a brown sugar frosting and chocolate chip cake, these moist cake pops are going to satisfy both kids and adults! Woah. That summer went by fast. Georgia has already gone back to school. What is with that?! Back in my day (yup, I sound old), I went back to school in the second week of August and that was still early compared to the rest of the country. Sheesh. I can’t say I am that upset because it just reminds me how close we are to fall. I can smell the pumpkin spice and apple cider already. Mmmm. But let’s not get too ahead of ourselves…it’s still the beginning of August so let’s celebrate with a new cookie recipe, shall we? As always, I share a new cookie recipe at the beginning of each month. Do you have a favorite yet? If I had to guess based on what get’s the most traffic, it is definitely these cookie bites, but these funfetti whoopie pies are creeping up each day. Those two are definitely in my top three, along with these ice cream sandwiches. They’re made with cookies so they count as a cookie recipe, mmmkay? 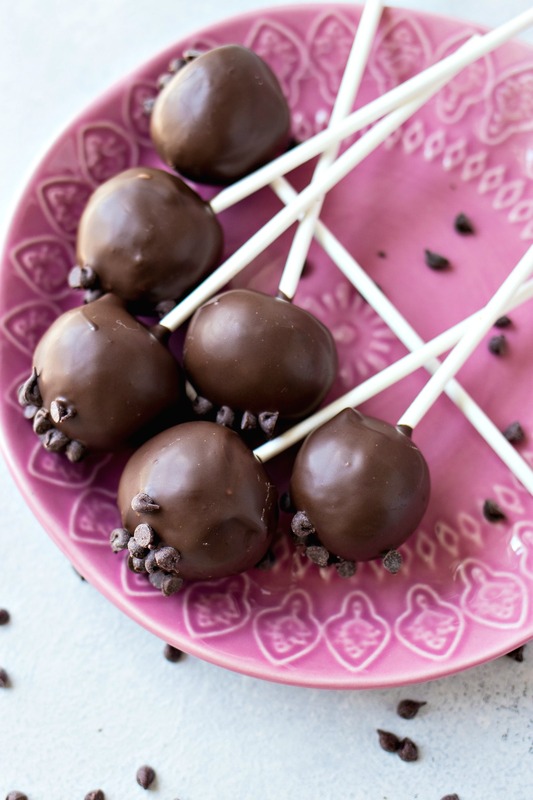 Chocolate Chip Cookie Cake Pops! This recipe was inspired by a trip to a well-known coffee shop. They sell some incredible cake pops there, with the birthday cake being my all-time favorite. But on this trip, I decided to give another flavor a chance. It was their cookie dough flavor. I am all about the cookie dough so I had high expectations for this treat. The verdict – bleh. It was fine, but I kept thinking about ways it could be EVEN better. First, the outer coating was white chocolate, which was tinted light brown to look like cookie dough. Nice presentation, poor flavor. In my opinion, the coating HAD to be dark/semi-sweet chocolate to go along with traditional flavors of a chocolate chip cookie. Second, the base of the cake pop did not taste like a cookie. I didn’t expect it to be the texture of a cookie, but at least it should have the flavor of one. Don’t worry guys – I made sure there was tons of brown sugar in my pop so there’d be no confusion about what flavor it was. I took all my observations and development my perfect version of a chocolate chip cookie cake pop. Before I get into the recipe, first let me explain how a cake pop is made. And no, it does not start with one of those cake pop machines. To make a perfectly moist cake pop that holds up well, you need to mix cake crumbles and cake frosting together and roll it into balls. If you simply bake cake into the shape of a ball, it would be too light in texture to stay on a stick, let alone be coated in chocolate. Brownies probably would work out this way, but not cake. For the cake base, I used a vanilla cake made with brown sugar and chocolate chips scattered throughout. After cooling and crumbling the cake, I made a brown sugar frosting and added in the crumbles. From there, all you gotta do next is roll the mixture into little balls, chill for an hour, and then assemble the cake pops. It’s really simple to do and a fun activity to do with the kids. Who doesn’t love rolling food into balls and dipping them into chocolate?! Make sure you cream the brown sugar and butter well in the first step of the frosting. Otherwise, your frosting will taste grainy. Before forming the cake balls, make sure the cake has cooled completely. If it’s still warm, it will melt the frosting and you will have a gloopy mess. After forming the cake balls, make sure you chill them for 1 hour before inserting the stick and dipping into chocolate. When the cake ball gets cold, the center gets firm and perfect for gripping the stick. Don’t worry – they won’t need to be chilled after assembly so the center will be nice and moist once it gets back to room temp. Make sure to use melting chocolate for the coating. If you simply use chocolate chips, the coating will never fully harden again and will be too soft at room temp. This does not look good for presentation purposes. Here is the chocolate I used. I found it at my grocery store but it’s also available on Amazon. Make sure you think through how you want to let the coating dry on the cake pops. I wanted a completely smooth outer shell so I wanted them to dry standing up. To do this, I inserted the coated cake pops into an empty egg carton. But you can use a cardboard box, too. Or you can let them dry upside-down on a plate. This will obviously cause them to be flat on the bottom but that also makes for a cute way to serve them at parties and such. There you have it – a new way to enjoy the flavors of a chocolate chip cookie. They were extremely well-received by our friends and family so I know they’ll be a favorite of yours too! What other cake pops have you tried? I need some ideas for what to make next – I cannot wait to make my next flavor! The classic flavors of a chocolate chip cookies smashed into a mini cake pop. Made with a brown sugar frosting and chocolate chip cake, these moist cake pops are going to satisfy both kids and adults! Preheat oven to 350 degrees. Prepare 13x9 rectangular pan by spraying with nonstick spray. Set aside. Add sugars and butter to a mixing bowl fit for a stand mixer. Using the paddle attachment, cream together until light and fluffy, about 3 minutes. Add sour cream and mix until combined. Add 1 egg and mix until combined. Add other egg and vanilla and mix until combined. In a separate medium bowl, mix flour, baking powder, and salt. In a small bowl, mix water and milk together. Add half of dry ingredients to batter and mix until combined. Add milk mixture and mix until combined. Add remaining dry ingredients and mix until combined. Gently stir in chocolate chips. Add batter to prepared dish. Bake in preheated oven for about 20 minutes, or until toothpick comes out clean when inserted. Let cake cool completely before moving on. Once the cake is cool, prepare the frosting. Add butter and brown sugar to the bowl of stand mixer. With the paddle attachment, beat the two together on medium high until ultra creamy, about 5 minutes. Add in powdered sugar and beat another 2 minutes. Add vanilla, salt, and milk and mix until combined. Crumble the baked and cooled cake while still in the baking dish. Add crumbs to the prepared frosting and mix together with the paddle attachment. It should only take 5-10 seconds to combine the two. Line a baking sheet with parchment paper. Scoop out about 1 1/2 tablespoons of the cake and frosting mixture. Roll into a ball and place on parchment paper. Repeat with rest of dough. Chill for about 1 hour in the fridge to let the balls firm up. This will make sure they stay on the stick. When balls have chilled, place baking discs into a 2-cup measuring cup or similar vessel that will be used for dipping. You'll only be able to fit about 10 ounces of chocolate into cup at a time. Microwave for about 30 seconds. Stir discs and then microwave another 30 seconds. Before you get started, figure out how you want the cake pops to dry. I wanted mine completely round so I used an egg carton to keep them standing up while they dried. If you don't care, you can place them on a baking sheet lined with parchment paper to let them dry with a flat bottom. Grab 1 ball from the fridge. Take a candy stick and dip it into chocolate, about 1 inch deep. Place stick into cake ball and then dip into chocolate. Gently tap on the end of the cup to shake off excess chocolate. Place into egg carton to dry or place flat onto lined baking sheet to dry. Quickly sprinkle with chips before the chocolate begins to dry. Repeat with remaining cake balls. I recommend leaving cake balls in fridge and simply removing them one by one for dipping. If you're using the egg carton, the cake pops will dry pretty fast so once you've filled it up, the first cake pops you did will probably be dry so you can safely remove and use that space for newly coated cake pops. Once cake pops have dried, you can store them in a storage container at room temperature for up to 3 days. I had to pin this recipe to make in the future! Looks so yummy! Wow! These look super delicious. I never knew that cake pops were make from cake crumbles and frosting, which makes total sense! It’s actually a lot easier to make than I thought and super trendy for parties! I’ll have to give it a try. I know right?! I had no idea how easy they’d be either. Let me know if you give them a try. Oh my goodness!! These look so yummy!! I can’t believe you are already back to school!! We don’t go back till after Labor Day!! What?! How crazy is that! Those are so pretty! My girls (and me!) would love them! These look incredible, looking forward to trying to make some! These look amazingly delicious! And pretty easy, I think I could make these, even with my previous cake pop fails!! Oh wow!! This looks absolutely delicious!! Oh man – I looooooove making cake pops. And I extra looooooove these are chocolare chip cookies in cake pop form! Omg I haven’t had a cake pop in forever! So delicious! How do you make these pictures look so yummy! Well-detailed recipe, thanks so much for sharing! These cake pops sound like such a decadent treat! I have never mastered them, but I think I must make them now! I am drooling! Mmm! These look SO good and even better than the ones I see in coffee shops!! I definitely want to try and make these when I have a party next! Aw thanks so much! What a compliment! These look so decadent and delicious! I love the extra chocolate chips on top! I love how cute and dainty they are, makes you want to have more than one asap. Yup, that’s definitely true! Thanks so much! Ok I have unsuccessfully made cake pops before, I loved all your tricks on why I may have not been successful in the past, I feel like I should try again. Aw I am so glad the tips helped you. I love including tips and I make sure to do so in every post. Let me know if you give these a shot! Love how easily you’ve broken down the steps and it doesn’t require fancy tools. Looks divine! Thank you! Yup no fancy tools today! So true! You can even decorate these in colors for bridal/baby showers! These look so yummy! I’ve seen cookie dough pops before but not baked cookie pops. Really want to give this a try! I’m always looking for quick and easy recipes for baking, this is right up my street! Love the look of the finished product!